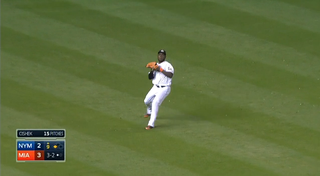 This Marcell Ozuna highlight is from Friday night, but it's still awesome enough to post now. The Marlins led 3-2 in the top of the ninth, but the Mets were threatening with one out and Kirk Nieuwenhuis on third base. Chris Young flied out to left, far enough that Nieuwenhuis could presumably get home on the sacrifice fly. But Marlins outfielder Marcell Ozuna made sure that didn't happen. Was it better than Yoenis Cespedes's throw to get out Howie Kendrick? Ehhh. But the situation makes Ozuna's effort quite impressive in its own way. Steve Cishek's save would have been blown if Ozuna didn't pull off that throw. Instead, the Marlins walked off the field with a game-ending double play.